Atiku Calls For Independent Investigation Into Abuja Shooting Incident. 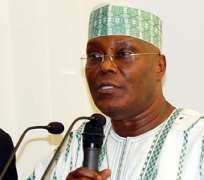 Former Vice President Atiku Abubakar says only an independent investigation by Nigeria’s parliament, the judiciary or civil society will unravel the facts behind the killing of nine citizens with 16 others injured in the reported shooting incident in the neighborhood of the Apo legislative quarters of Abuja, the Federal Capital. Since the incident took place in the early morning hours of Friday, there have been conflicting reports concerning the shoot-out with the State Security Service (SSS) claiming that they had a confrontation with the insurgent group, Boko Haram, while independent sources are indicating that the victims were economic migrants squatting in the uncompleted building. In a statement by his media office on Saturday, Atiku said he became disturbed following the accounts by the Reuters International news agency as well as the local media that the victims were squatters who came under attack at the instigation of owner of the building. 'For me, this issue borders on human rights, the rule of law and the sanctity of human life. Our security services should stick to their role under the constitution: make the country safe.” said Atiku. He said while every citizen should support the government’s efforts to counter terrorism and defeat it, allegations of abuses and extra-judicial killings must not be swept under the carpet. The former Vice President decried the tendency of security agencies to profile certain Nigerians, in spite of constant denials to the contrary, saying that terrorist profiling was a fact of life today in Nigeria. He recalled that in 2006, in took riots by Igbo traders in the Federal Capital Territory to force the government at that time to investigate, arrest and charge police officers that allegedly killed six Igbo traders they branded as armed robbers. “There must be an independent investigation into this incident to insure human rights and the rule of law. Things don’t have to get to this sorry pass,” Atiku cautioned the authorities.